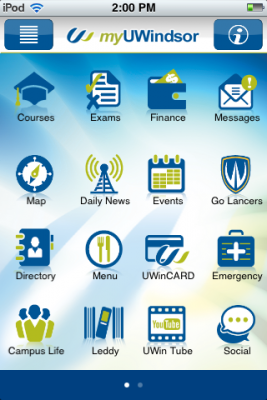 The Leddy Library can now be found in the University of Windsor's mobile app. At the moment, you can check with a glance whether the library is open and with just a click, you can see what books you have out and when they are due back at the library. In the future, we're hoping to make our mobile app provide a different experience from our website. One idea we're thinking about it providing an mp3 in the mobile app so you can have your own private audio tour of Leddy. But we'd really like to know what you might like from the Leddy Library mobile app. Please let us know in the comments!